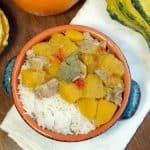 Thai Green Curry is a spicy curry with a unique, herbal flavor. Making your own homemade Thai Green Curry Paste is an easy way to give your curry some incredible flavor. Green curry is a variety of curry from central Thailand. Sweet or Spicy Green Curry? In the States, it’s common to hear that Thai green curry is more mild than a Thai red curry, but, actually that’s a bit of misinformation. This probably came about because you will sometimes hear Thai green curry called “sweet green curry”. 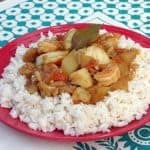 “Sweet” actually refers to the light green color of the curry, not the flavor. 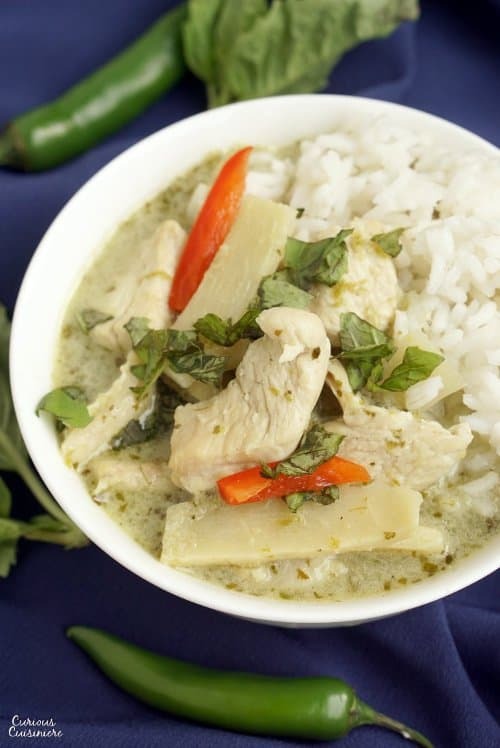 Thai green curry actually brings more spice to your bowl that the well known red curry. 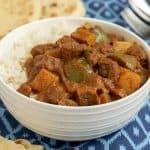 So, if you’re a spice lover, this curry is for you! 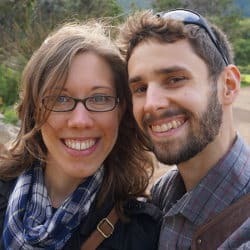 Sure, it’s easy to head to the store and buy a jar of green curry paste, but honestly, we find the flavor of those jarred pastes to be a bit disappointing, particularly in the case of green curry paste, because often the jarred green curry pastes are made to fit the American idea that Thai green curry is very mild. Making your own homemade green curry paste is incredibly easy. If you like an arm workout, you can use a mortar and pestle, but to make things even easier, you can just use your food processor. The one tricky thing about making authentic Thai green curry paste at home is that the traditional recipes call for a lot of ingredients that can be hard to find if you don’t live near a well-stocked Asian grocer. Traditional ingredients in Thai green curry paste include fresh green chilies, shallots, galangal, garlic, lemongrass, kaffir lime leaves, and Thai sweet basil. Each chef is going to have their own take on green curry paste (much like Italian grandmothers and tomato sauce), so you will find many recipes with a longer list of ingredients, but these are the basics to creating a wonderfully balanced and aromatic Thai green curry flavor. Some of these ingredients look very familiar. Most grocery stores carry lemongrass in their produce section with the specialty herbs. And, Serrano chilies are a common, although milder, substitute for the traditional fresh green Thai chilies used in traditional green curry paste. But, some of the ingredients probably have you scratching your head. Galangal (pronounced guh-LANG-guh) is a root commonly used in Thai cooking that looks similar to ginger, with a thinner skin. While its look and treatment is similar to ginger, it gives a distinct pepper and citrus flavor to soups and curries. 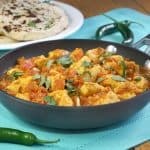 While the flavors of galangal and ginger are distinct, many recipes will call for ginger as an ok substitute for galangal. True Thai chefs will tell you that ginger is never a good substitute for galangal, however, since we’ve never been able to find galangal in stores, we do regularly substitute ginger for it, knowing that we are making a slight trade off in flavor. Kaffir limes are a nobbly little citrus fruit native to Asia. The leaves of the kaffir lime tree are often used in Thai recipes to give a unique citrus flavor. Although slightly different in flavor, you can substitute 1 Tbsp common lime zest for 6 kaffir lime leaves. Thai basil is a unique basil with a slight licorice flavor. The leaves are smaller and more narrow than those of sweet basil and the stems are purple. 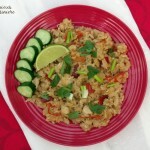 Using sweet basil isn’t a direct substitute for the flavor of Thai basil, but it can work in a pinch. Just use less sweet basil than what the recipe calls for Thai basil. Now that we know a little about what ingredients make up a traditional Thai green curry paste, it’s time to look at our easy version. We have created a Thai green curry paste recipe that gives you a similar flavor to authentic Thai green curry paste, using ingredients that are readily available here in the States. 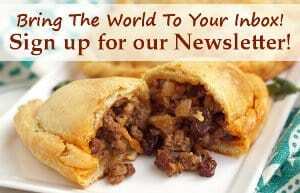 If you live near an Asian market, and have access to the more authentic ingredients, great! Feel free to use them. 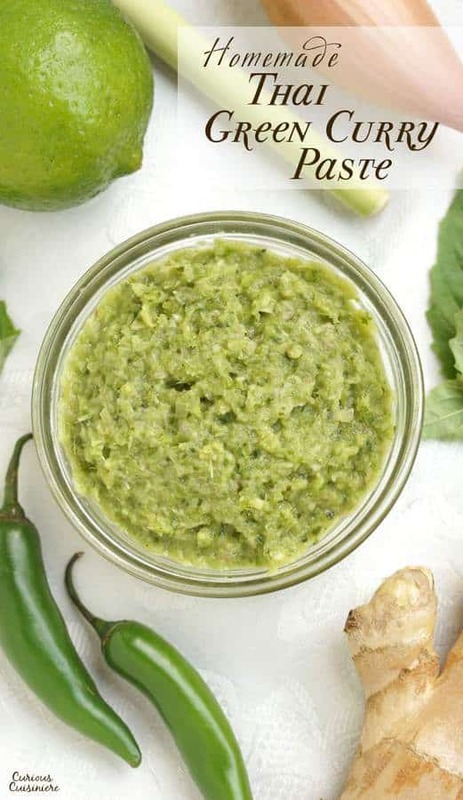 But this green curry paste recipe is intended to be a good substitute for those of you who want to make your own curry paste but don’t have access to the harder-to-find ingredients. The other nice thing about making homemade green curry paste is that you can control the amount of heat in your curry paste. As is, this recipe gives you a green curry with a lightly glowing heat. If you like the fresh, floral flavor of green curry, but don’t like a lot of heat, dial back the number of chilies in your paste. If you love fire, then throw in a couple more! 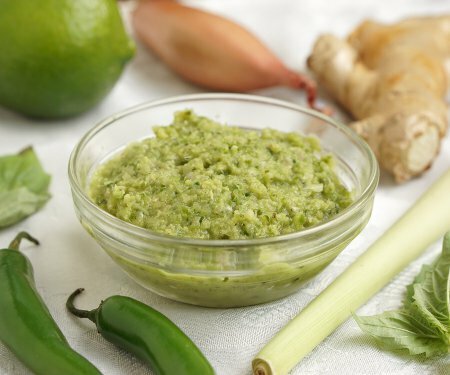 Thai green curry paste uses fresh, green chilies to create a paste that is spicy and floral with a well-balanced sweetness and acidity. Combine the chilies, garlic, basil, shallots, lemon grass, and ginger in the bowl of your food processor. Pulse to finely chop. Add the lime zest, 1 tsp lime juice, salt, and sugar. Pulse the mixture until a paste starts to form. Add the oil, 1 tsp at a time, as needed to help the mixture come to the consistency of a thick paste. Use the fresh green curry paste immediately or store it in an air tight container in your refrigerator for up to a week. 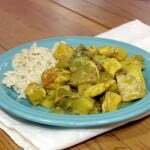 Thai green curry is traditionally made with lighter colored vegetables and meats, including fish or chicken and bamboo shoots or Thai green eggplant. 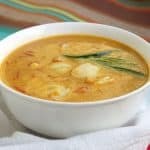 It is a simple, soupy curry made with coconut milk, which nicely balances the heat of the green chilies. Once you have your green curry paste, making a Thai green curry is incredibly simple. It’s a perfect weeknight meal, coming together in less than 30 minutes. 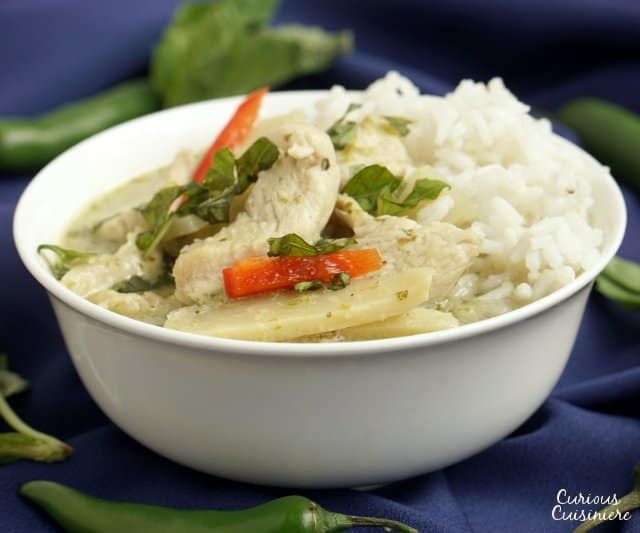 Once you have your Thai green curry paste, making a Thai green curry is simple! Coconut milk brings a creamy texture to this spicy curry. Be sure to serve it with a generous helping of rice! In a medium pot heat the oil. Add the curry paste and saute over medium heat until fragrant 2-3 minutes. Add the coconut milk and water. Bring the mixture to a simmer over medium high heat. Add the bamboo shoots, bell peppers, and lime zest. Mix in the fish sauce and sugar. Simmer until the chicken is cooked through and the liquid has reduced slightly, 7-10 minutes. Add thai basil just before serving. * If you want some extra heat in your Thai green curry, substitute a hot red chili for the red bell pepper. 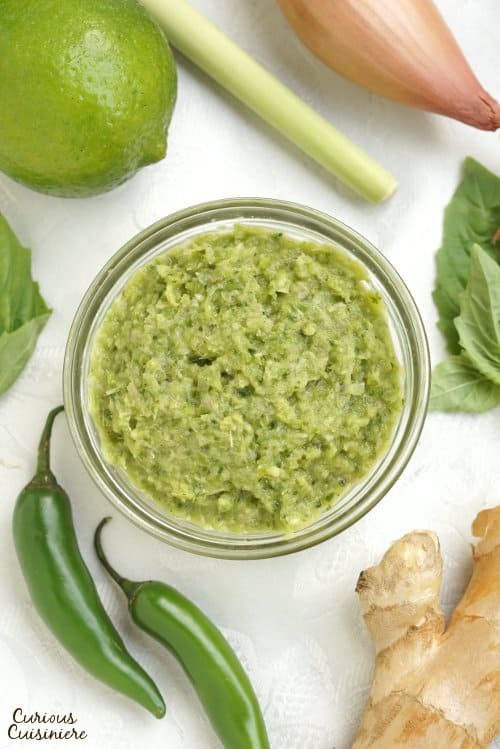 What’s your thoughts on how to make a mild green curry paste? Should I just use a green chili pepper that is lower down on the Scoville scale? Or is there a certain type of much milder green chili that will keep the dish tasting Thai that I wouldn’t really have thought of? Hi JC. I would just use a green chili that’s lower on the Scoville scale. 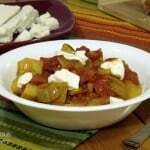 You could try young jalapenos or even a poblano or green bell pepper if you wanted it really mild. Let us know how it turns out for you! As far as substituting sweet basil for thai basil, note that thai basil keeps its flavor more than sweet basil in the cooking process, so I would recommend adding the minced sweet basil at the end of cooking to maintain flavor.